Months after completing the residency I finally found time to post on image from my time there. Everything Waffles and the Warpath Gallery are ready to announce the Everything Waffles Retrospective. This exhibit displays the portraits from 2010-2013. You can view the online catalog at their website at http://cargocollective.com/warpathgallery. It’s time to inform you about the latest underground workings from us. We have started a new Kickstarter to bring a new project to printing by the end of July. The comic book, yet to be given an official title, will be printed and mailed out to supporters and those who wish to purchase it. Why so quickly? Why the rush? We are aiming to attend San Fransisco’s Zine Fest this year in September and also trying to attend Comic Con San Diego this time next year. The zines and comics will be shown at these events as well as shirts and small figures created to support the project. Unlike the previous Kickstarter funding project, I want to create comic books and web series inspired by the portraits I have created for the past 2 years. We are entering a world of fiction now and moving away from the parody that has been Everything Waffles. Want to help? Just check out the Kickstarter for all the information. 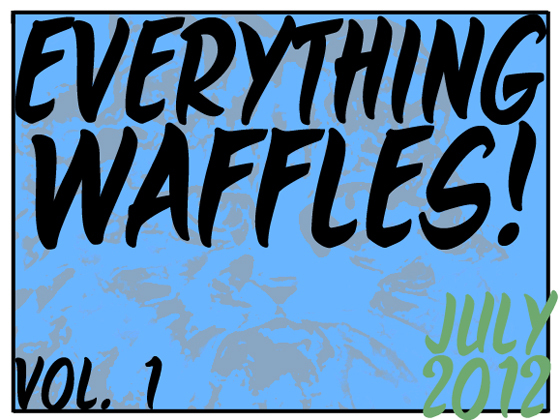 Like it, share it, and post it as much as you can so that we can expand the Everything Waffles Universe.